I’m excited to be partnering with the Partnership for Food Safety Education (PFSE) and their Story of Your Dinner campaign to raise awareness of simple and effective ways that we can reduce the risk of food borne illness. All thoughts are my own. I love cooking for the holidays. 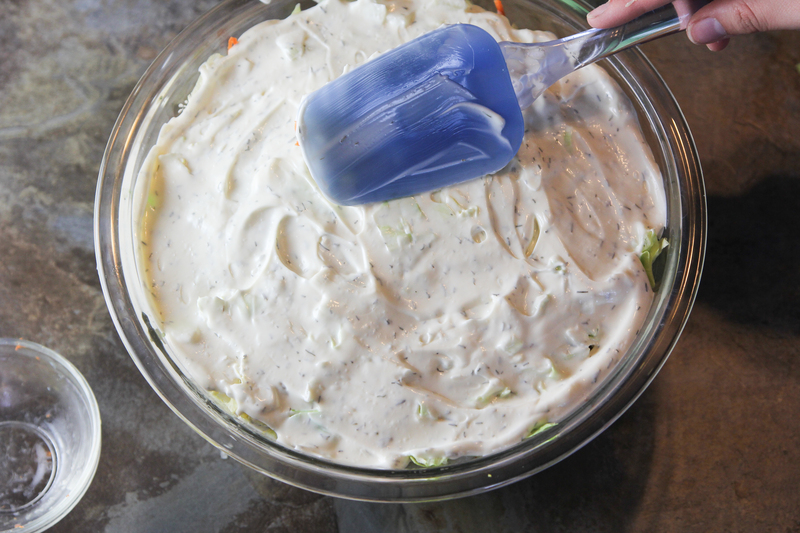 Some of my favorite recipes are reserved just for big holiday gatherings with family and friends, like this recipe for 7-Layer Salad. It’s something I look forward to all year long! My family has been serving this green salad at holiday dinners for as long as I can remember. 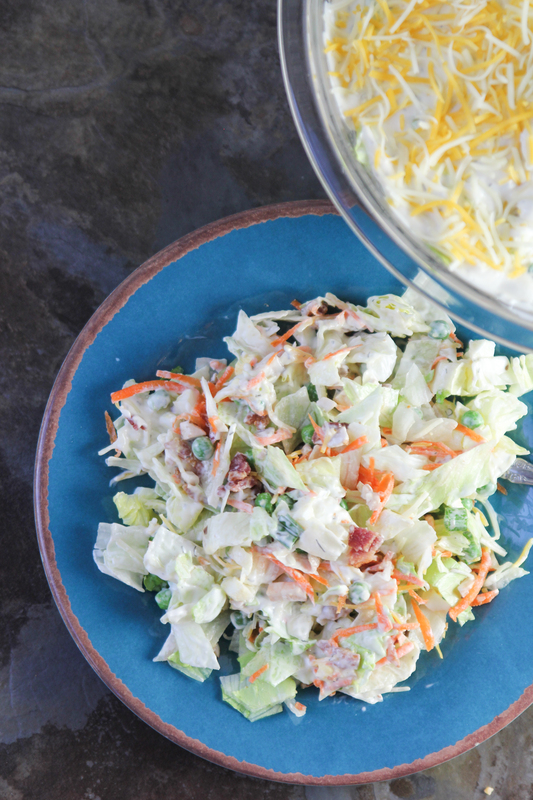 It’s full of seven of your favorite salad ingredients (plus lettuce and a delicious homemade dill dressing). Even my kids go crazy over this salad! Prepare each of the salad ingredients and place in individual bowls. 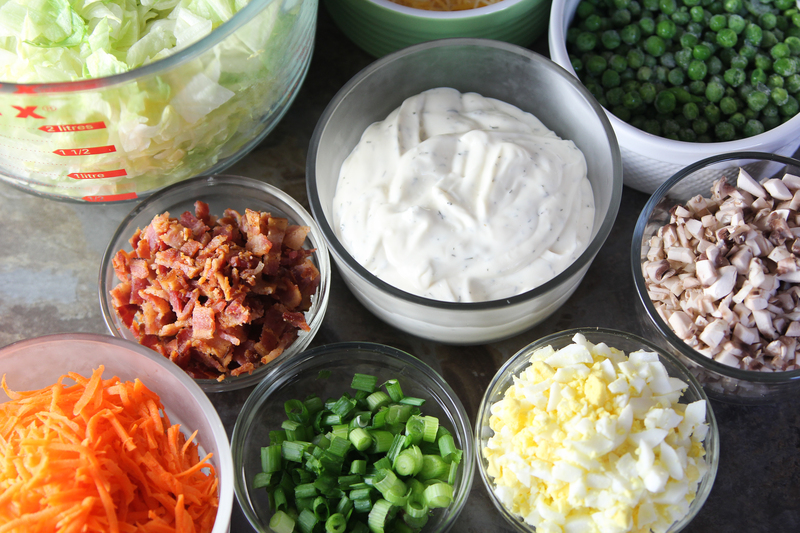 Layer the following ingredients, divided, in a large salad bowl (this works well in a glass bowl so the layers can be seen). Start with about one cup of lettuce, followed by a third of each of the next seven ingredients. Repeat the layers 3 times, ending with the last cup of lettuce on top of everything. 1. Start by washing your hands with warm water and soap for at least 20 seconds before and after handling food. 2. Wash your cutting boards and countertops with hot soapy water. 3. Rinse fresh produce under cool running tap water just before cutting or shredding. Blot dry with a clean cloth towel or paper towel. 4. Place each salad ingredient in individual bowls. 5. 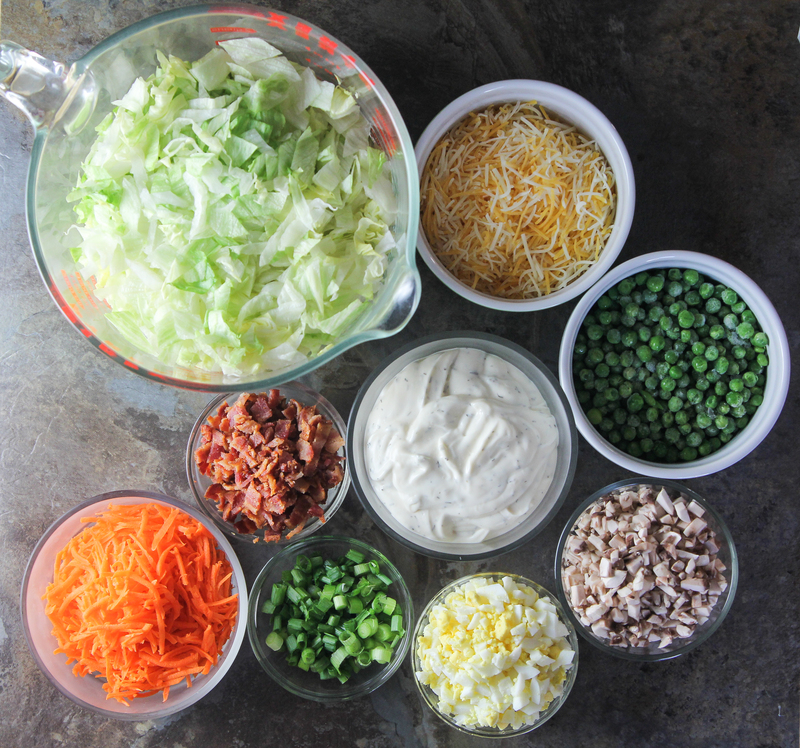 Layer the ingredients, divided, in a large bowl (this works well in a glass bowl so the layers can be seen). 6. Start with about one cup of lettuce, followed by ? cup mushrooms, peas, carrots, eggs, bacon, onion. Repeat the layers 3 times, ending with the last cup of lettuce on top. 8. Spread prepared dressing on top of the last layer of lettuce, sealing the edges of the salad. 9. Top with ¼ cup cheese and chill 2-24 hours. 10. Store leftovers in shallow containers within 2 hours of serving. Leftovers will last in the refrigerator up to 3-4 days. Note: this salad is best served without tossing. It’s important to remember to follow basic food safety procedures during the holidays, when we tend to spend more time cooking in the kitchen and linger a little longer around the table. 1. Clean: Wash hands and surfaces often. Bacteria can be spread throughout the kitchen and get onto hands, cutting boards, utensils, counter tops and food. 2. Separate: Don’t cross contaminate. Cross-contamination is how bacteria can be spread. Improper handling of raw meat, poultry, seafood and eggs can create an inviting environment for cross-contamination. As a result harmful bacteria can spread to food and throughout the kitchen. 3. Cook: Cook to the safe internal temperature. Food is safely cooked when it reaches a high enough internal temperature to kill the harmful bacteria that cause foodborne illness. Use a food thermometer to measure the internal temperature of cooked foods. 4. Chill: Refrigerate promptly. Keeping a constant refrigerator temperature of 40°F or below is one of the most effective ways to reduce the risk of foodborne illness. Learn more about the simple actions your family can take to reduce the risk of foodborne illness at The Story of Your Dinner webpage. Not only is the site full of helpful and easy-to-follow information about food safety at home, but it also features a 2-minute animated video and kid-friendly downloadable placemats that emphasize food safety and other health-focused information. Wash your cutting boards and countertops with hot soapy water. Rinse fresh produce under cool running tap water just before cutting or shredding. Blot dry with a clean cloth towel or paper towel. Place each salad ingredient in individual bowls. 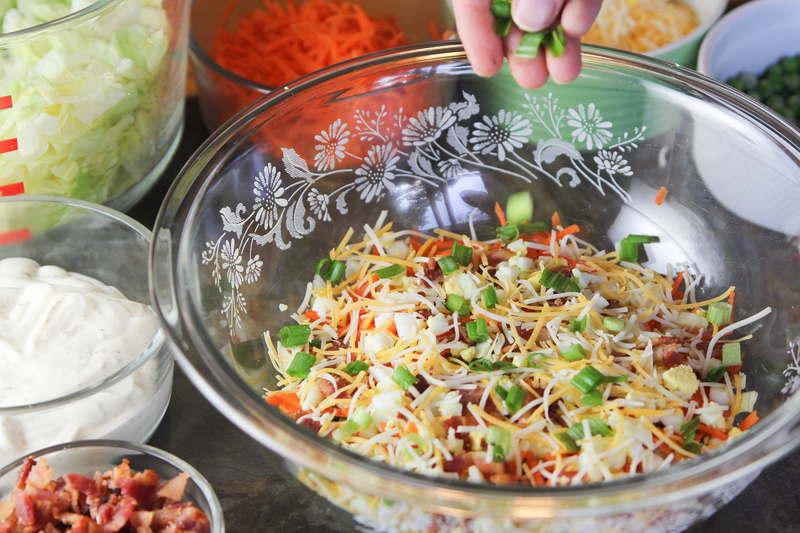 Layer the ingredients, divided, in a large bowl (this works well in a glass bowl so the layers can be seen). 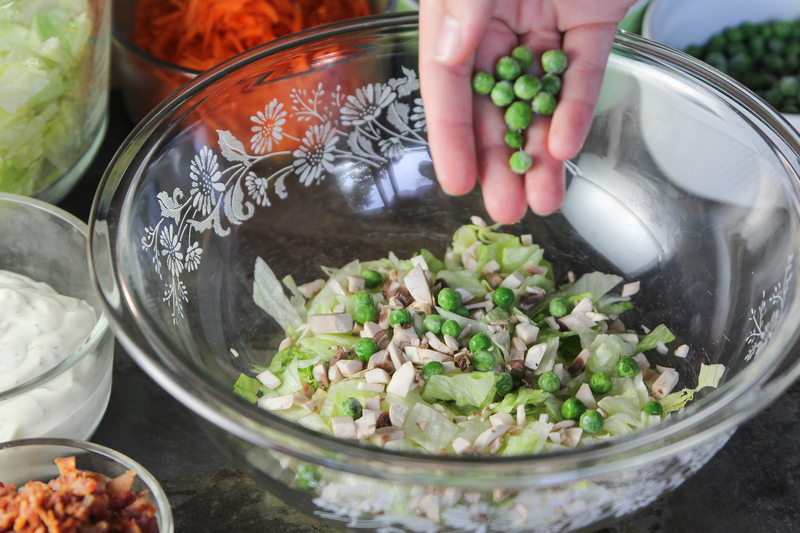 Start with about one cup of lettuce, followed by ⅓ cup mushrooms, peas, carrots, eggs, bacon, onion. Repeat the layers 3 times, ending with the last cup of lettuce on top. Spread prepared dressing on top of the last layer of lettuce, sealing the edges of the salad. Top with ¼ cup cheese and chill 2-24 hours. 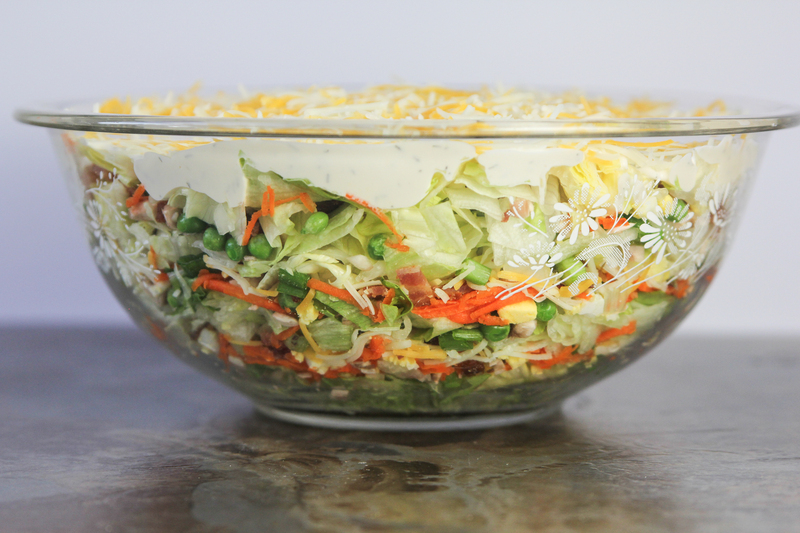 I love layered salads like this! They look so pretty. You have to use a glass bowl to appreciate its beauty! This salad looks delish! I may try it for a party this weekend! This looks like a delicious salad. This would be great to serve at any get together. This would be a good salad to make for Thanksgiving or Christmas. I love eating salads and this one looks so delicious! Thanks for sharing. Looks delicious! I always love trying new salad creations. This looks so good. I want to make this soon!